djkardkreations: Did you get the license number of that truck? Did you get the license number of that truck? I write to you from my bed within the ivied walls of the mental hospital where I've been secrusted since Thursday dawn. In the middle of the night I was awakened by either King Rupert and his cavalry, angry at a recent remark I made about his mussels, or a truck that drove through the bedroom. Mister slept through it all. Well, that's not prezactly true, but it sounds so much more interesting than a bowel obstruction brought on by Crohn's Disease. The CT scan shows there are gremlins and gerbils nesting in places they shouldn't be so the good doctor wants to inspectigate further tomorrow with a camera in places cameras were never originally intended to go. So I'll be asunder for the next few days. The bad news is that this has happened several times in the past, and the good news is that this has happened several times in the past, so I am old hand at it. This is an onion I'm quite adept at peeling. Things will get better in the end. Titter, titter, get it? In the end?! It's interesting to be "NPO." Surprisingly "NPO" means "nothing by mouth." Shouldn't it be "NBM" then? NPO actually goes back to the Latins and means "nil per os." So now you know that if you get really angry, but you still want to be polite to spouses and kids and coworkers, you can say, "Please, sweetheart, shut your os" and not sound rude. On second thought. When I just said that out loud, it sounded even MORE rude than, "shut your mouth." Up to you. You might get a kick out of making people walk away wondering where their os is. I don't have access or standmama to make cards from my bed, but I can share cards I've made in the past, just because I know you like cards. Here is one I made last year, one of a series actually, and the rest are here. 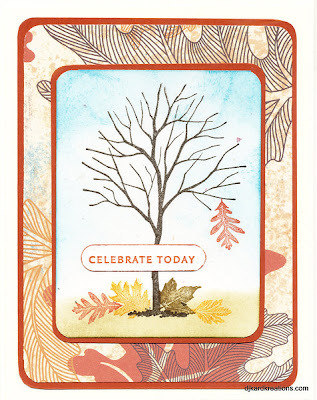 That tree stamp is so versatile. So that's about all the steam I have in the kettle today. I want to apologize for not getting very far around the WOYWW hop before I crashed, and for not being able to keep up with your blogs. Also, if I have/do visit your blob and leave a cray-cray comment (even for me), please understand that it is difficult to type with an IV stuck in the top of your hand and your brain cloudy from Dilaudid. For instance, there, I didn't mean to call your lovely blog a "blob." Heavens. 1. Thank you so much to the The Play Date Cafe for awarding me a "Cream in Our Coffee" badge for my Bugs and Kisses Card. Talk about perfect timing! You cheered me up immensely! 2. I'd like to introduce you to our latest friend, Sandi McLean of Maximum Embellishments! I know you will visit her and make her feel welcome with us. Thank you, Sandi! As follower 151, you have broken through the blog benchmark as we now climb to Ward 200! 3. We are getting down to the nit and grit making our Christmas cards, but can we take a minute, here in the US, and reflect on the poor turkey stuffed literally in between Halloween and Christmas. Enjoy your beautiful day! If Monday (Veteran's Day) is a holidy for you, enjoy your extra long weekend!! As always, thank you for stopping by to visit. Special thanks to you if you take the time to join as a follower or leave a comment! Darnell, I'm sorry to hear you aren't well (although you are still firing off the clever cracks just fine!). My Mum has had Crohn's disease for the last 25 years, and while it is okay at the moment, there have been some struggles over the years. I hope the doctor finds that it isn't so bad, and that something simple will fix you up as well as you can be, as quick as can be. I do understand it's a tricky disease to manage. Today is Rememberance Day for us here in Australia. We pause on the 11th hour (11am) of the 11th day of the 11th month to remember those who fought for us. I imagine that Veteran's Day is much the same. We have our holiday on ANZAC day in April, but we always mark Rememberence Day at 11am - you could hear a pin drop all over Australia at that time. I forgot! Congratulations on the award at Play Date Cafe! I loved that card! Girl, you need to take care of yourself! My golly. And still thinking of sharing with us when you're in pain and drugged. I love the tree and when I saw the title, thought you were going to say that a truck sped by and whipped those leaves off that tree. Wish that was the case. Feel better soon! Just wanted you to know my thoughts are with you. I hope everything turns out alright. 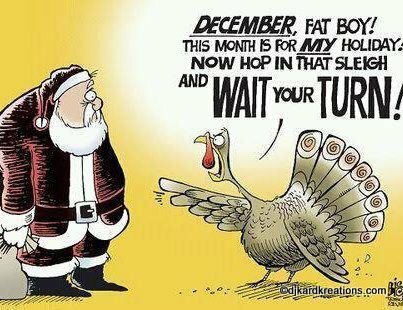 On a side note that turkey / santa sentiment is too funny! Hi Darnell, sorry to read that you are under the spell of long tubes with cameras and the fun 'prep work' for this test. I hope that whatever is causing the trouble is found, treated and goes along it's merry way. Maybe you had one too many screwballs? Just joking !!!!!!!!!!!! 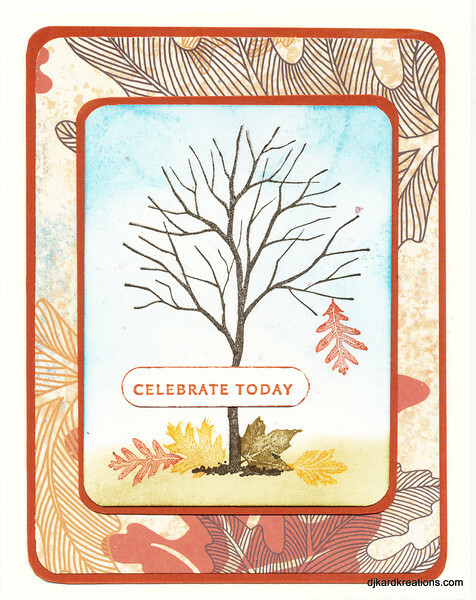 Your card is fabulous, love the sentiment and the background as it compliments the fallen leaf and leafless (is that a word?) tree. Congrats on your award for the bug card, I loved it. Your humor seems to be intact,no matter what the circumstance. So sorry to hear you are at the hospital! Hope that you will be back creating in your Playhouse in no time! Glad that you haven't lost your sense of humor! Congratulations on your award! Aww, I'm so sorry that truck ran right over you, but hopefully you'll be back in biz again soon and feeling much better. TC of yourself and I hope you feel much better soon. You're a super trooper to not lose your sense of humor through all of this! Keep on keepin on! Oh my Darnell you poor thing. I am so sorry to hear that your Crohn's acting up. I have two brother's with it and I have been tested for it because MS has an unpleasant way of playing with your bowels too. So sad to hear you are in the hospital! Hope you are back at the Playhouse soon! Oh gosh Dippy - I'm so sorry to hear your news; how awful.........know too well about that little camera entering places it just wasn't meant for! What a trooper still posting from your sick bed - but I'd expect nothing less from you. Hugs are winging their way across cyber space to aid your speedy recovery. I just came over to say "you're awfully quiet, what are you up to" and I'm sorry to hear that you're not up to mischievous fun. Or even just working too hard. Hope you're better soon - I miss you! Aww, poor you! I hope you're soon sorted. Congrats on the Play Date Cafe shout - it was a stunner! Oh Darnell - fancy ending up in hospital just as I was gonna ask you to help clear up the mess in the Playground after the bonfire got out of hand, the local fire brigade turned out in force and everyone else ran away and hid! Hope you feel better really soon - good to see your sense of humour remains intact and (so far) uninspected by camera thingy. Hope you are at the "tail end" of this episode and are home soon. Congratulation on your win, that is a cute card. Keep up the great attitude. Hugs to you. Speedy recovery wishes! Not a fun time/procedure, but just think how clean & tidy things will be....for a bit at least! Now, isn't it just like the sweet you that you are, to think about us instead of yourself. Girl, you get back to bed and get better. We'll hold down the Crafting Fort till you get back! Darnell~So sorry to hear you are having some rough times. Kind thoughts and wishes to you for a quick recovery. I too appreciate your humor and love the cartoon! Hugs to you! Darnell, So sorry to hear about your obstruction....hopefully all symptoms will "pass" quickly! I'm also sorry to hear that you are labeled NPO...I'll eat something for you....okay? Hope you're soon back to your normal self (whatever "normal" might be!) LOVE the turkey humor...and I have to say I totally agree with the turkey! I just passed a house tonight that already has all their Christmas lights up and running! Geesh! Let's be THANKFUL first! Feel better! Darnell, I hope you are feeling better very soon! My grandmother had Crohn's and I remember how difficult it was for her. I applaud you for staying positive and I will keep you in my prayers! Oh my...you are such a trooper! And your sense of humor is so amazing too and always a bright spot in my days. I wish you all the best and pray that the camera's only see what they should be seeing. Never in a million years would I have thought that what we use to preserve our memories can be used to seek out those nasty little gremlins. Take care and you are in my prayers. Hope you feel better soon, Darnell! Darnell, first thank you for the welcome! As another "frequent flyer" of the hospital, I know that keeping the good humour going is the only way to get through! Must say my hosp doesn't have wifi that I am aware of..will be checking that out and making sure it is installed before I am LOL Yes we also recognize Nov 11th in Canada - visit me for a pic of my handsome Mountie in his Red Serge. Hugs my new friend! Oh, Darnell, I'm so sorry to hear that your innards have landed you in the clink!! I hope that you are doing well and that everything clears up soon. Behave for the nurses. Thinking of you! So sorry that you have been feeling unwell, Darnell. I adore your sense of humor even though you are facing some challenges. You make it sound amusing for us as it can be....although it is really not! I hope you are on the mend and are able to share your beautiful work soon again. And belated congrats on wining the title of the Cream of the Coffee!Way to go, girl! So sorry you're feeling yucky. Been there, done that but not to that degree. I've missed your snappy patter so please get well soon. Oh boy am I late to the party. I'm just catching up on your blog now. SO SORRY that you were in the hospital, holy cow! You simply amaze me with your positive attitude. Congrats on your Cream in Our Coffee award (YAY!) and thank you so much for the kind sympathies you left me.